*Having trouble starting your own Search Story? 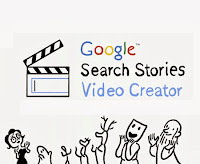 Then try finishing one of these examples (Search Stories Starter Set). - Try using the different kinds of search (maps, images, products) to add variety to your story. - Use different search features (a list of them can be found here) to help get a big plot point across quickly and clearly. - Try and build a narrative arc that ends with the last search delivering a surprise or, better yet, the beginning of a new story. - Make it personal! Tell the story of something you accomplished, fell in love with or discovered. Or make it about aliens. That's cool, too.